This week finds me in Frisco and Plano TX teaching the final week of SMU's summer module. My friend Elizabeth Stringer, full time faculty at SMU's Guildhall video game program, invited me to teach their first publishing production class. The experience has been a blast in terms of working with some great students and learning to teach mostly remotely via Google Hangout. With the final project of the class requiring me to be in person for the student presentations, I planned to stay here the entire week. Happily, Elizabeth and her family provide an excellent bed, breakfast and dinner, so I am able to enjoy hanging out with my friends. With the Dallas area approaching 95 each day (actually below normal for this time of year), I only planned to run one day while in town and to visit the gym for other workouts. I left the run for today, my birthday, since I always run on my birthday. That starts the day off right in my opinion. But where to go today? I poked around the internet to see if any good trails or running places popped out at me. I know of the Katy Trail and have run part of it before, but that's over 30 minutes drive from Frisco down into Dallas. A 90 minute run isn't great when you add in 1 hour of driving. Mapmyrun.com showed me some local running on streets in Frisco, and what caught my eye was a lake west of Frisco - Lewisville Lake. 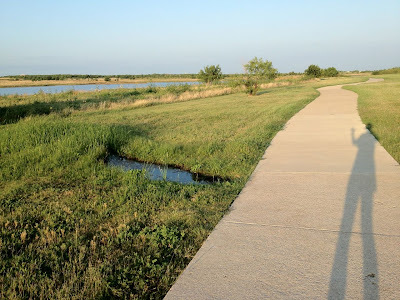 I could not tell if a path near the lake existed, so instead I decided to see if I could at least run to the lake and back. The lake is huge, so I could just reach a finger of it. When searching for a run in a new location, often a way to make it enjoyable is to pick a landmark and try to find it. I spent a few minutes looking at Google Maps to get a general sense of where I was heading, and then I just ran that way. Even on long runs, where most people complain of boredom, having a destination can make a training run more fun. In a new city, this type of plan helps you see the area from a new perspective, and you get a sense for the landscape and people. 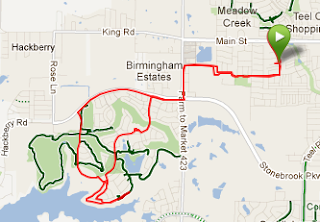 With a plan for 9 miles, I thought I could pretty much reach the lake. So off I went generally heading southwest away from the rising sun behind me. I entered a newish home settlement area with a big golf course I had seen on the map. That also got me away from early morning traffic on the larger streets in the area. At 4 miles of running, I figured I better pull out my iPhone (a good idea when running in a new area) and see how far was I from the water. I had .5 miles left before I had to turn around. So, I did not want to miss the lake because of a wrong turn or two. In fact, I was at the lake's edge - but I couldn't see it due to the houses built around the lake. A few more feet of running revealed a paved path between two houses and seconds later I was on the lakeside path. I ran that for a mile before heading back to my friends' house, successful in my pursuit. I stopped at the development's community center to avail myself of their drinking fountain. When running, keep an eye out for places to get water - be it convenience stores or public facilities. All in, an enjoyable 85 minutes of running. The heat wasn't too bad - a local sign told me it was 77 degrees. I got to say hello to people walking in the neighborhood and found my destination as planned. And I got a blog post out of the experience too! Know how far you want to run. Even 2 miles can lead you some place like a park or coffee shop. Glance at a map or ask locals about the conditions. Many cities have major roads without sidewalks or bike paths. You want to avoid those. Smaller streets are usually safe to run on the side of the road. Pick your goal and go for it. Assume you will need 30 seconds per mile longer than your normal pace. Bring water, a phone and some money just in case.